I had a bunch of riders interested in forming a dual sport motorcycle club in 1995 so I sent out notice about a new club and had about 20 people show up at my place in Fullerton and formed the club in 1995. I was providing sweep for Ride for Kids for a couple of years with my gang from California Trail Rides, but the new Dualies club took over that function in 1995. After a couple of years we decided to get serious about raising money for the Pediatric Brain Tumor Foundation and with the help of Fineline Motorsports in Huntington Beach, we put on a Parking Lot sale and raised about $4000. The next year, we raised an amazing $15,000 and our club was off and running. It outgrew the parking lot at Fineline so the next year we had it in the Cobra Engineering lot and after that for a number of years had our sale at the Adelanto Grand Prix. We became the #1 fundraising club each and every year since then for Ride or Kids.• I believe 2004 was the last year we did the Adelanto Grand Prix but in 2005 we promoted the On Any Sunday Reunion and raised around $40,000! 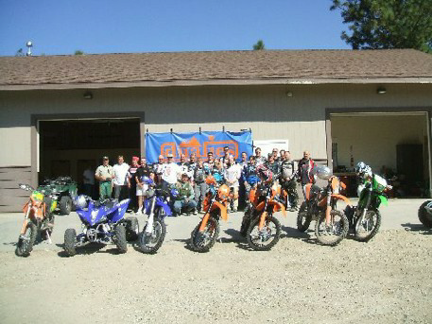 We also raised money from helping with the Hi Desert 250 and started promoting our own dual sport ride out of Beaumont. • In late 2004 I notified the club that my wife and I planned on moving to Bass Lake in 2005 and the club should elect new officers and get better organized. Dave Harlan was elected as president and served 2 or 3 years until Larry Harmier took over. 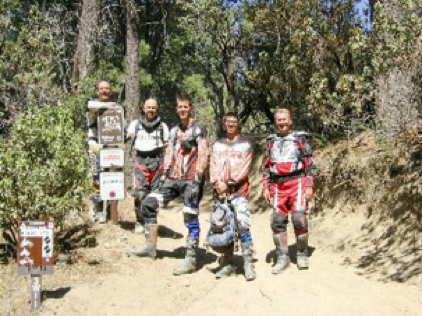 •In 2007 we hosted a Take it to the Limit film showing as a fundraiser and then in 2008 again hosted another On Any Sunday Reunion .•The club adopted a trail in the Arrowhead OHV area a few years ago and maintains the trail every year. I served as president for 3 years (2005-2008) helped organize the club into a 501C organization to create some transparency for accounting and fundraising and updated the club website. The OAS (2) and Taking It to the Limit Fundraisers were great success thanks to Larry Langley and Eric Bondus. With Larry Langley gone and the decline in the economy, donations and the fire sale at the Adelanto Grand Prix became too difficult. I wanted to get back towards our sport and thus we started the Beaumont Charity Ride that has been running for 6 or 7 years. With Larry Harmier taking over as President, the focus towards more rides and club outings has grown and has seen the club membership flourish once again. My term started in 2009 and will run through 2011. The club really is a club run by the members. We have everyone who wants to be involved, be involved. The board members handle all the legal aspects, but the direction this club has gone in my term has been member driven. We have a great core of members and are seeing more new members all the time. We still only have one charity we support, and all of our proceeds from our rides go to the Pediatric Brain Tumor Foundation. One of my biggest moments has been this last year when I was able to ride with a new member and survivor. We have a plan on putting on additional rides to support the charity, but we still need to take care of our Adopt A Trails, 3W11 and 3W13. 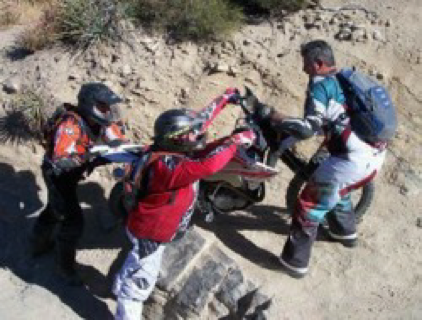 Luckily we have monthly rides which we use to both work on the trails and also have fun. I have been the Dualies president for 2012 & 2013. We still continue to contribute to our charity, the Pediatric Brain Tumor Foundation through the Beaumont Charity Ride. We have stepped up our efforts with other fundraising activities, such as 50/50 raffles and by collecting “pre-owned” motorcycle gear and selling it on Ebay. 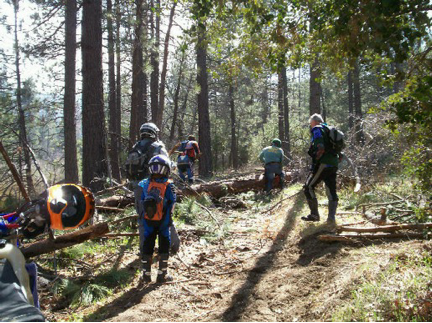 We still have monthly club rides, taking advantage of the great local riding areas, we have available, such as Arrowhead, Big Bear, Santa Ana Mts, and the high desert. We have an annual club camping trip where we camp in Big Bear then ride to Pioneertown. We also have a weekend campout that we combine with a Dealer Demo Day and instructional seminars. The Dualies also attend such events, as AMA Supercross, Motocross, and Endurocross. I have been fortunate to be able to utilize the new technologies now available. The Dualies have a Facebook page to supplement our website, and we keep everyone up to date with mass emails sent to the club members. We can also send out GPS tracks for our club rides and also to the Charity Ride participants.